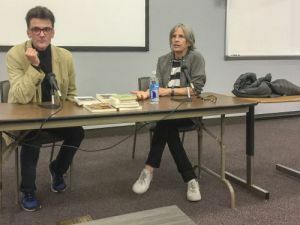 Poet and novelist Eileen Myles, who has been described as “one of the savviest and most restless intellects in contemporary literature,” presented a reading from “Afterglow (a dog memoir),” a poetry workshop, and a Book Talk Feb. 8-10 as part of the Pensacola State College Lyceum Series. 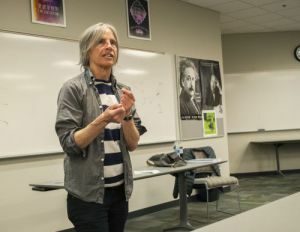 Myles, the author of more than 20 books including “I Must Be Living Twice: New & Selected Poems,” and the 2015 reissue of “Chelsea Girls,” spoke on Feb. 8 in Ashmore Fine Arts Auditorium. 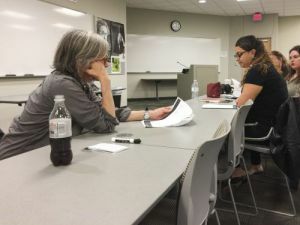 On Feb. 9, Myles hosted a poetry workshop in Chadbourne Library, and held a Book Talk in the Anna Lamar Switzer Gallery later that day. Novels, poetry collections and other writings by Myles are available at the college’s library and campus bookstores.